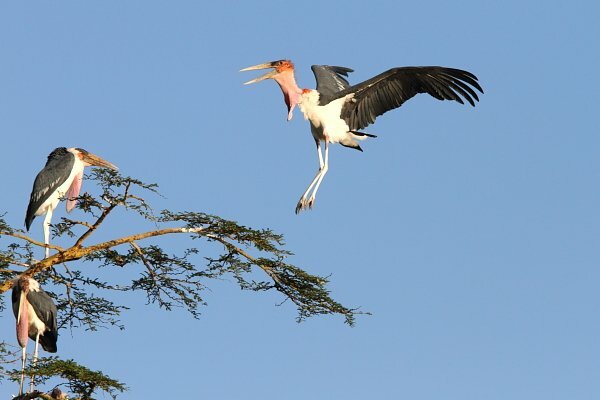 Africa has more than its fair share of storks, with 8 of the world’s 19 species gracing the continent. Furthermore we have another very special stork-like bird, the regal Shoebill, previously known as the Whale-headed Stork but now placed in its own family. Storks are typically viewed as wetland species and whilst some storks are restricted to aquatic habitats, others are not. This blogpost discusses and illustrates Africa’s stork species, with Shoebill added as a bonus or honorary stork! We’ll start off with the largest and ugliest of them all (measuring up to 60in (152cm) in height, a weight of 20 lb (9 kg) and a wingspan of up to 12ft), the Marabou Stork. Its name comes from Arabic, meaning a Dervish with supernatural powers. Like the Adjutants in Asia and Jabiru of the Americas, the Marabou is our bare-headed scavenging stork. 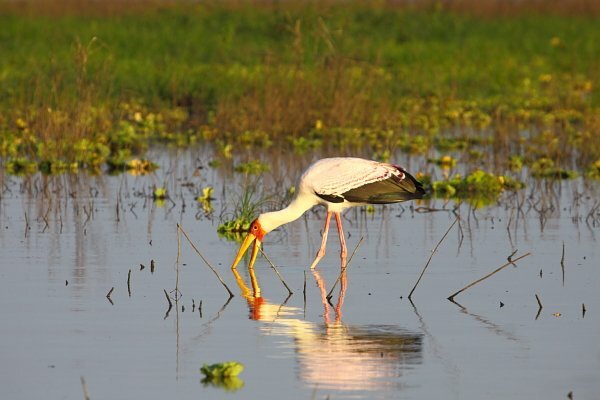 It is predominantly a wetland bird and most productive larger wetlands and lakes of Africa will support a population of these large, hulking birds that hang around the shallows searching for fish, waterbird nestlings and anything else remotely edible. If there are human fishing activities then all the better – Marabous will gather in numbers around fishermen’s docks and fish markets, in fact anywhere where fish are cleaned and scraps disposed of, allowing these intelligent birds to obtain a free meal. 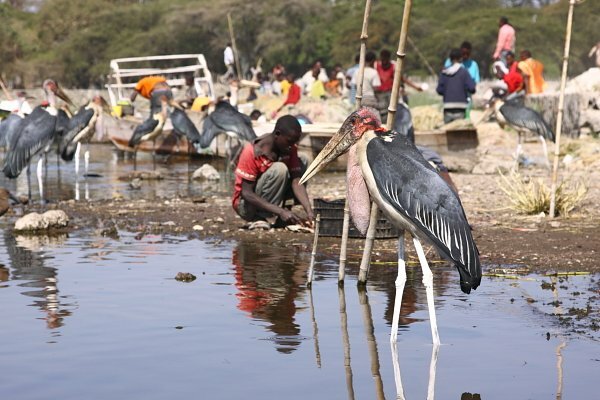 Ethiopia’s Rift Valley lakes such as Lake Ziway and Awassa are famous for the gangs of Marabous that hang around the fish markets and allow close approach in the hope of a smelly handout. Rubbish dumps are another favorite, and just like the most reliable stake-out for the endangered Greater Adjutant is Guwahati’s stenching rubbish-dump in Assam, India, so can Marabous be found at many rubbish dumps in Africa, slowly picking their way through the rotten mess looking for anything edible. As a result they sometimes even nest in the trees lining the streets of some African towns and villages. They don’t often move into big cities, however Uganda’s capital, Kampala is an unusual haven for Marabous who use its high-rise building as roosts. The story goes that they only moved into the city during the time of the murderous Idi Amin who enjoyed throwing his victims off tall buildings, and the corpses were left for the Marabous to dismember. Marabous have also learnt another trick, and that is to follow vultures and scavenge off the remains of Lion and other large predator kills. The Marabou’s enormous bill makes them the king of the scavengers and even Hyenas are wary of approaching a Marabou’s dagger-like mandibles. They have even been known to kill children who have been incautious enough to approach too closely. As with most other storks, Marabous are not vocal but a loud bill-rattling courtship ritual is often performed at nesting colonies. Marabous occur throughout tropical and subtropical Africa from Zululand in northern South Africa right up to the arid Sahel region fringing the Sahara Desert, avoiding the closed canopy rainforest zones of central and west Africa. 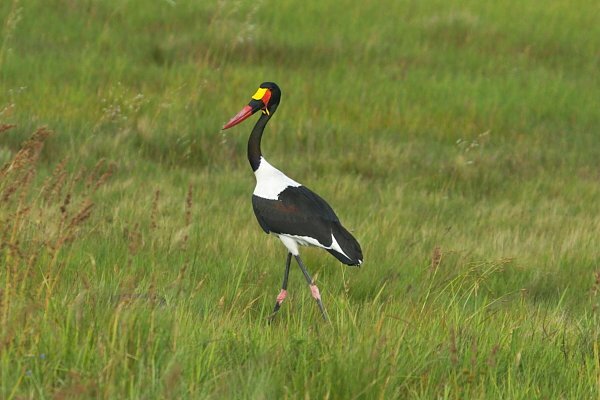 Second largest, and at the other end of the attractiveness scale, is the stunning Saddle-billed Stork. Only slightly shorter, but more elegantly built than the Marabou, the Saddle-billed also has a sister species in Asia, the Black-necked Stork. Saddle-bills are more strictly restricted to wetland environments where they are adept at catching their own fish with their enormous upturned bills. They also prey on frogs and crabs. Sometimes they have to protect their catches from piratic African Fish Eagles who swoop down as soon as they that see a Saddle-bill has successfully caught a fish. They display subtle sexual dimorphism, the male having dark eyes, dangling yellow wattles and more black in the wing, whereas the female has bright yellow eyes, no wattle and incredibly white wings that are absolutely striking in flight. Their name is taken from the yellow “saddle” atop the bare red skin at the base of their bill. The Saddle-billed Stork has a similar Africa-wide distribution as the Marabou. The Yellow-billed Stork has a closely-related sister species in Asia known as Painted Stork. It is also related to Wood Stork of the Americas and Milky Stork of Asia. This is another wetland species that nests in sometimes huge colonies atop trees bordering rivers and lakes. They are often found roosting in small groups along the edges of lakes and riverine sandbars. Their preferred feeding method is to stand in knee-deep water along the edge of reeds, their bright yellow bill partially submerged and slightly open. They then slowly move through the water, stamping their feet, in search of frogs, small fish and other aquatic life that are quickly snapped up. During breeding season, their white plumage turns a delicate pink color, a lovely sight indeed. The Yellow-billed Stork also occurs throughout Africa bar the far south and far north and they do partake in seasonal intra-African movements. Its range also extends to nearby Madagascar. 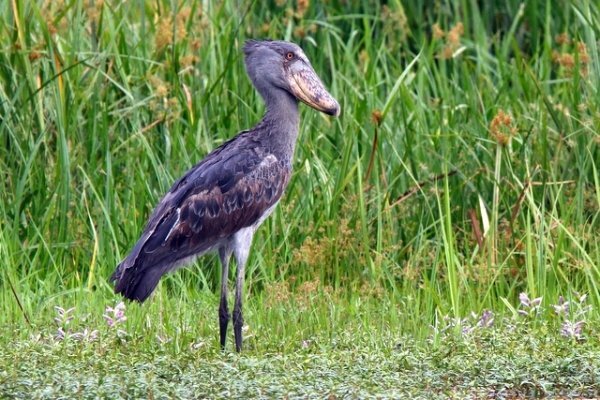 The African Openbill is an all dark stork named for a curious gap in its closed bill, formed by bizarrely shaped upper and lower mandibles that have evolved to separate in the center. This gap is used to maneuver this species’ favorite food, large aquatic snails, into a position where they can be shucked from their shells. Further to the east, Asian Openbill displays the same special feature but is mostly a white plumaged bird. 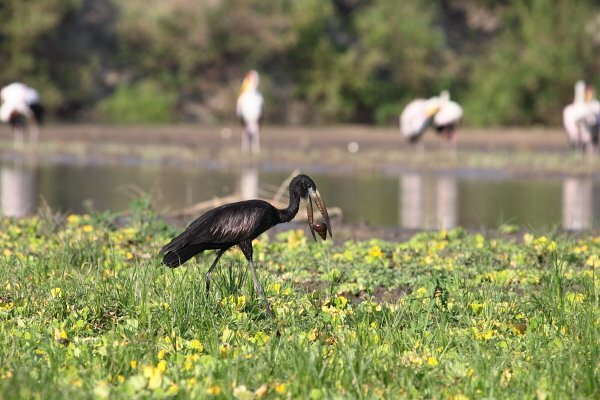 The African Openbill is one of Africa’s smallest storks and rather slight in build. They nest in large colonies, often mixed with numerous other waterbird species. The African Openbill also has a similar Africa-wide distribution (barring most of South and North Africa) as the previous four species and partakes long distance movements (usually triggered by rainfall) through the continent and to Madagascar. In 2010, a remarkable and previously unrecorded phenomenon occurred when thousands upon thousands of African Openbills appeared from nowhere and spread throughout South Africa, even to the far southern tip of the continent and remote Karoo semi-desert regions where they had never been recorded before. Many hung around until they died weeks, months and sometimes even a few years later, and the reasons for this irruption and the birds’ source remains a mystery. 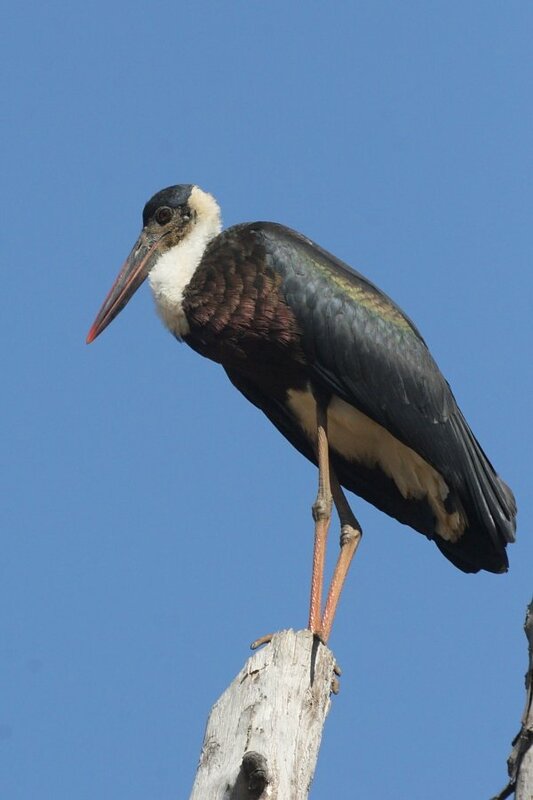 The Woolly-necked Stork also has an interesting story of range expansion in South Africa. 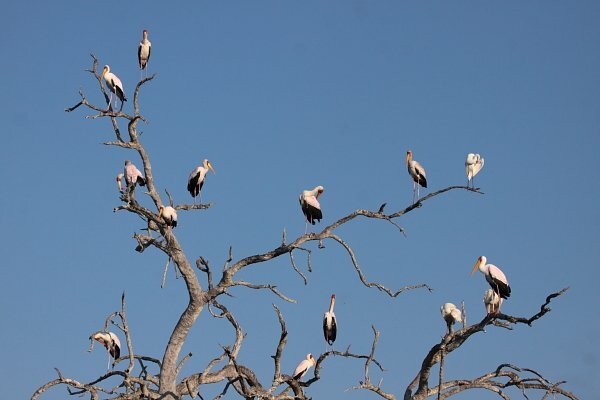 When I first started birding 25 years ago and asked what the rarest bird in my province was, the answer received was the Woolly-necked Stork, with just 3 or 4 breeding pairs in the big game reserves of Zululand. During the intervening years it has spread right down to the far south of the province as well as inland, with hundreds of breeding pairs now in KwaZulu-Natal province. And at the same time, Woolly-necked Storks have modified their behavior to survive even in urban gardens where they scrounge for dog food on back porches! Further to the north, they occur throughout Africa south of the Sahara and unlike the previous species, their range stretches onwards through Asia, as far east as The Phillipines. A dark bird with a white belly and neck, its shoulders show iridescent gloss in sunlight and its neck appears fluffy, hence its name. Abdim’s or White-bellied Stork is the world’s smallest stork species and shows the most regular migration of the storks we have so far discussed, moving with the rainfronts through Africa. It appears in southern Africa only during the Austral summer months, usually in large flocks that seek out locust and flying termite eruptions. Once the drier winter months approach they move northwards into East and West Africa where they are particularly attracted by bushfires. It is quite a sight to experience hundreds of Abdim’s Stork dropping out of the skies from seemingly thin air, to gorge on burnt or fleeing insects and rodents. This stork is named in honor of Bey El-Arnaut Abdim, a 19th century Turkish Governor of Wadi Halfa in Sudan. The White Stork is the most strictly migrant of all our storks. It breeds on chimneys, roofs, buildings and trees throughout Europe, parts of Asia and even North Africa. In the northern winter, the bulk of the European and North African population migrate down into Africa, as far as South Africa, where large numbers frequent fields where they hunt for insects and rodents. They are also attracted by fires and can gather in thousands. An aberrant small population has decided that it’s far too much of an effort to migrate all that way back north to breed, and have since 1933 started breeding just north of Cape Town. 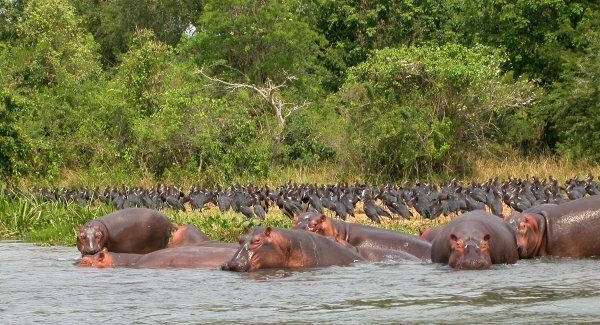 Satellite tracking has shown that these individuals migrate northwards through South and into East Africa during the winter months. This southern breeding behavior is also undertaken by European Bee-eater and no doubt the genetic isolation of these local breeders will eventually lead to the evolution of new species of stork and bee-eater over time – just as many other species have evolved in a similar way, for example Forest and Mountain Buzzards, which evolved from Steppe Buzzards that stopped migrating and bred in Africa. The elegant White Stork is the species that fable has decided is the deliverer of human babies, a belief that dates back to ancient northern European folklore. 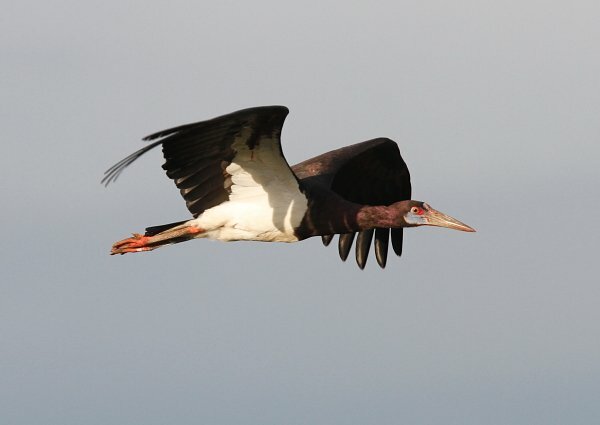 Our final true African stork in Black Stork, another species shared with Europe and Asia. 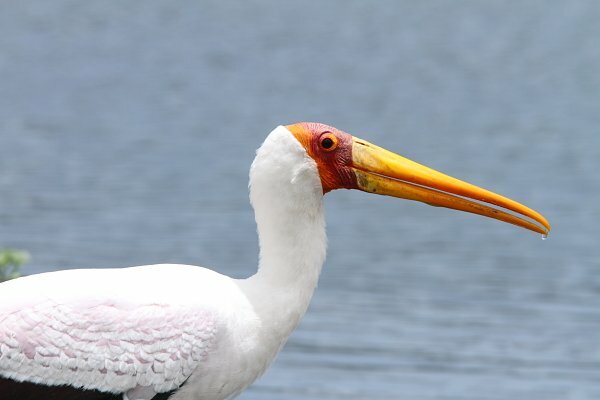 In Africa we have both Palearctic migratory and resident African populations, however the breeding population of this species in Africa is far larger and more widespread than the few dozen White Storks that breed in the Cape. Black Storks prefer to build massive stick nests on cliffs (although tree nests seem to be the norm in Europe). They are more aquatic than the closely related White Stork and spend the bulk of their time foraging on the edges of rivers, mostly in search of frogs. In winter, inland local breeding birds are often found at coastal locations where they forage along estuaries and lakes. And now to our honorary stork, the Shoebill. This colossal bird is now placed in its own family Balaenicipitidae and it forms an ancient link between storks and pelicans. Previously known as the Whale-headed Stork, its scientific name of Balaeniceps rex translates as “King Whalehead”, in reference to its giant whale or shoe-shaped head and bill. A massive gray bird with a staring yellow eye, its broad bill sports a vicious hooked tip used for catching its favorite prey of lungfish, catfish and watersnakes. The Shoebill spends its time absolutely motionless on the edge of papyrus swamps, suddenly dropping face-first into the water to grasp a fish. In the heat of the day they often soar high into the sky, not something that one would expect of this bird! The Shoebill’s center of distribution are the Sudd Swamps along the Nile in South Sudan, with smaller numbers occurring into southwestern Ethiopia, Uganda, western Tanzania, Rwanda, Burundi, Congo (DRC) with an isolated southern population in the Bengwuelu Swamps of north-eastern Zambia. It should sensibly occur in the vast Okavango Swamps of Botswana, but all records from this region have been discarded. 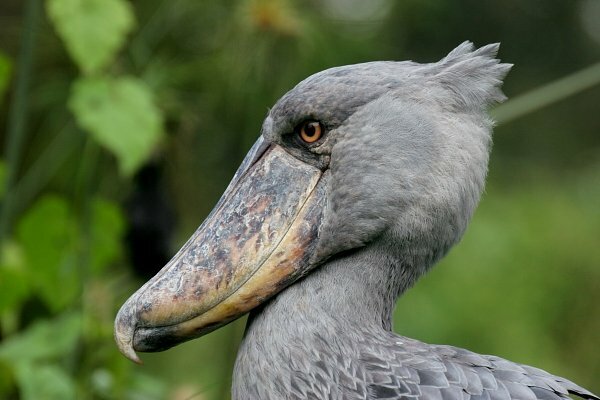 Due to disturbance by fishermen, habitat destruction and nest robbing for zoos and bird collections, the Shoebill is now classified as vulnerable. Storks are truly magnificent and fascinating birds and the Shoebill is one of the world’s most unusual and sought-after species, Africa is truly blessed to have such a superb collection of these large birds. Wow!!! This is a phenomenal presentation of some seriously superb birds. Thanks, Adam! We have had a black stork in our garden, collecting a frog from the pond. Thanks for the comments and well done on the Black Stork in your garden, what a superb and unusual garden bird! 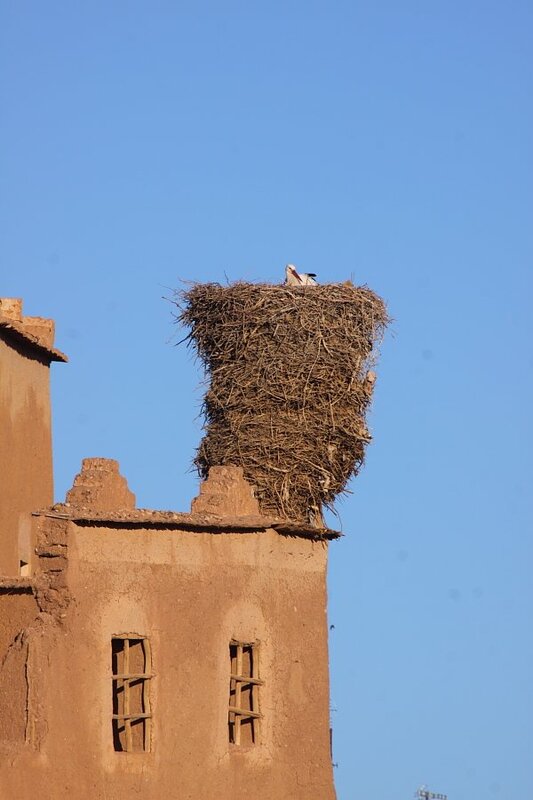 I adore the photograph of the old nest in Morocco. It has such a beautiful blend of two ancient forms of architecture. Damn. A great post, both for the information and the photos. The shot of the White Stork nest is priceless. Well done! that visit my garden on a daily basis. We are adjacent to the Umhlali Golf course. I give them a bit of gouda cheese, they love it. I have noticed that the birds droull alot, is that common. They have even ventured right into my home looking for food. Excellent article and photos! Storks and other big birds like Shoebills are some of the most exotic birds on the planet. Thanks a lot for shedding light on these birds and certain areas in which to find them. thank you Adam, beautiful write up and pictures. i am working on checklisting birds of mubi north and south local government areas of Adamawa state of Nigeria. black stork is predominant of the stork;although it seem migratory and their number seems to dwindle from september.thank you again. kennedy. Hi Adam. We found a large stork like bird in the open plot next to our house. We are having difficulty identifying what type of bird this is. Please can we email you a picture to ask for advice on what this might be. 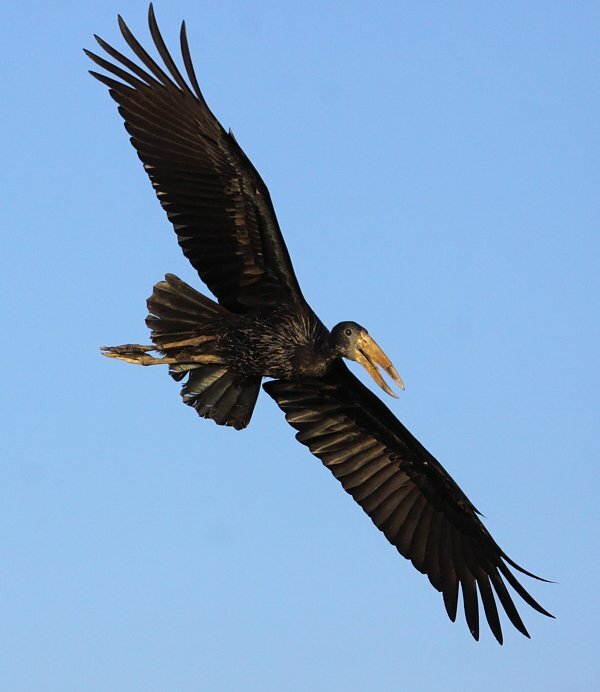 It looks closest to a Marabou, but we read they are not commonly found in the Western Cape. Thanks. Tarryn. Great information – thanks. A question though. We, like many of our friends in the Kloof/Hillcrest area entertain a pair of Woolly necks – breakfast, lunch, dinner, mid-night snacks etc.!! A few weeks ago we saw a great congregation of WN’s soaring high above and then they disappeared – migrating presumably. However, our mates don’t seem keen to go!? What is their migration range and should we be concerned about Willie and Wallie!? A Virus and El Nino? Saving your Pennies for the Peterson Auction?